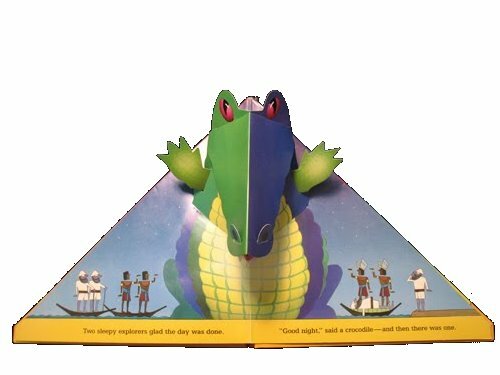 A 3-D adventure through the Egyptian desert with your child and Six Brave Explorers... 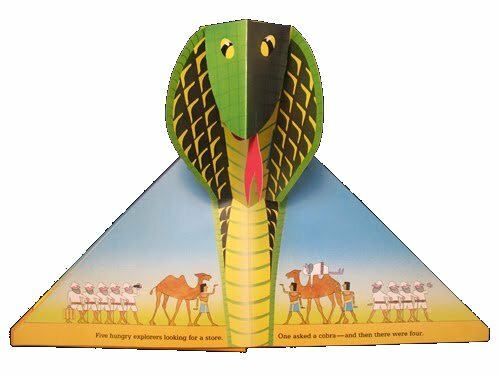 But, the group dwindles as the story unfolds, making this clever pop-up book a valuable and fun math aid. Triangle shaped book. Personalized with stickers that you apply. The group went out tolook around; soon up this bird did slip. The large bird'swings knocked one man down, Nicholas was left with five. "We can not letthis get us down; there's much to be explored,"
Nicholas thought,"These men are crazy"; plus he was getting bored. One man yelled,"I need a doctor," then there were only four. As they continued ontheir journey, Nicholas missed his friends. This trip was onethat Michael and Andy just could not attend. A panther scared oneman, who fainted, then there were but three. Nicholas now jumpingat every shadow, just wanted to go home. Marion was such awonderful place so far from where he'd roamed. Then one man fellover laughing, and they were left with two. Two brave explorersknow that Nicholas must be tired. But then they saw aset of eyes that looked to be afire. Nicholas said,"Let's go right now, this doesn't look like fun." But one man fell intoa trance and then there was but one. It's time for us toleave this place or I'm a soloist." But I am very sleepy,and must go home and go to bed."